Youth work can be challenging for all those involved but that's also what makes it exciting, interesting and fun. Up and Running is designed to help you in your work with young people, providing practical guidance, ideas and links to places where you can find further information and resources. Don't worry if you are not able to do it all straight away. Up and Running is divided into easy to read sections so you can dip into the specific parts of the site you feel are most relevant. 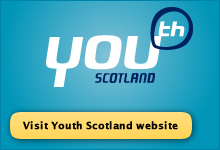 The Youth Scotland membership and the youth work sector in Scotland generally is diverse, ranging from small rural clubs to large urban projects. For consistency within Up and Running, we have used the term 'youth group' to refer to the environment in which your work takes place. This may include clubs, projects, cafes, drop-in centres etc. We have also used the term 'youth worker' to refer to all those in a leadership role, whether these are paid workers or volunteer leaders.